We were married on July 02, 2016. It was a beautiful evening, and the music was perfect. DJ Ray joined us for our reception. He was a delight to work with during the planning process and he did not disappoint on the day of the wedding. His website was helpful and easy to use. It allowed us to choose songs for different parts of the wedding reception, like our entrance, cake-cutting, and first dance. He also announced us as a couple and helped to direct guests during dinner and throughout the evening. Ray was accommodating to requests, but he was sure to stick to the plans we had outlined and supported our vision for the reception. Ray provided lighting that enhanced the mood and made for a lot of fun as we danced the night away. Ray is very fair with his pricing. He will help to create a personalized experience for your event. I highly recommend DJ Ray for any event. Ray was nothing short of amazing, and an integral part of our wedding and reception. He was phenomenal to work with from beginning to end. Our guests had nothing but wonderful comments about the music and his professionalism. His website was very easy to navigate, and when I requested a call prior to our special day to discuss last minute concerns, he put all of my concerns to rest. I can't recommend him more highly. He met every expectation and then some. Over the Top and setting the Bar higher! Ray was and is the consummate professional, DJ-Ray provided the P.A. system with wireless Mic's for the service the toasts and speeches that seemed to go on and.... well, on. We had an issue with back lighting on the curtains behind the arbor and Ray brought the lights and coordinated with the decorator with out hesitation. We had several compliments on the back ground music which Ray selected virtually on his own and it all worked. I would use him again if I had another daughter but alas only one this life time. He DJ's during the week, I may go just to listen 5 stars Ray. What can we say- DJ Ray is the best out there! He is a one of a kind professional. He responded to all of my emails within hours & even met with my parents to discuss further questions that we had, as I live out of state. His planning forms are very easy to fill out to ensure a smooth wedding day and Ray made sure to reach out to me with ay questions regarding any of the songs and timeline. He did the music for our ceremony & reception- the entire night ran so perfectly. 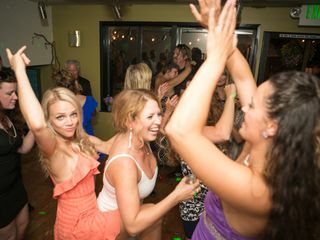 The dance floor was an absolute blast due to DJ Ray's amazing work and we have had nothing but raving reviews from our guests. Overall, he is an amazing DJ & so great to work with! Dj Ray was great to work with. He was very responsive in the planning process and even came to our rehearsal. We got a ton of people saying they loved his transitions. The highlight for me though was when our wedding cordinator told him to play the song I was supposed to walk down the aisle to before the wedding party was ready. I was panicking because I knew the song was about to end and no one had even started walking down the aisle yet but DJ Ray looped the song so perfectly no one even noticed! His quick thinking was greatly appreciated. Ray is worth every penny! With very little guidance he read the audience at my wedding perfectly. He did background music for a cocktail hour, guided our table releases for the buffet line, and really kept us on track all the way through dancing and last call. I was worried that no one would be dancing at my wedding but he had us all on the whole evening, old and young. He knocked it out of the park. I could not be happier with how the entire event came together. So thankful! An Absolute Masterclass in Entertainment. I could not be happier with DJ Ray. He provided entertainment and performed as the MC at my wedding in Tacoma. Leading up to the wedding he was very responsive, easy to work with, provides an easy to use website, and simply handled all of our requests. During the event, he was dressed very well, handled all aspects of his job professionally, worked easily with our coordinator, and worked in all of our last minute and oddball requests. The processional and recessional music were executed flawlessly. We were worried about the processional music ending while the bride was walking, as I have been to weddings where this happens and it is tragic, but Ray told us not to worry and used his magical DJ powers to ensure that the song played as long as needed with no dead air. During dinner and during the dancing part of the night, we wanted Ray to do his thing and entertain the guests, so we let him know that we had no special musical requests. He read the crowd and played exactly the right songs, at exactly the right times, with seamless transitions, and provided a huge variety of music that hit the spot with all of our guests. Even the bride's 80 year old grandmother was out there on the floor all night. I saw a number of people talking with him during the night, and he seemed to handle all of their requests as well. Seriously, if you're going to have entertainment at any event, hire Ray. His rates are very competitive and he does an incredible job. Ray was a great DJ and really kept the party going. He was very professional and organized which really put me at ease. I would definetly recommend DJ Ray to anyone who is in a need of a good DJ for their wedding. Wow, what else can I say? I was able to track Ray down when our original DJ fell through. I'm not saying last minute but last few months to be sure. I was very lucky that Ray was available. I'm not one who can identify songs or artists but that is not to say I do not like music its just not my thing, luckily it is Ray's thing and he does it well! With the minimal of input for the songs for key points of the evening he kept things rolling along like clockwork, down to and including getting everyone to the dance floor after the cake cutting and keeping them there for the rest of the evening. This should not be your last chance at getting a DJ like it was for me, it should be your first choice. We were very lucky to have found Ray. He was easy to work with and was very accommodating to all of our requests! Ray handled our ceremony, cocktail hour, dinner and reception music and everything was absolutely perfect. As a bride, the last thing you want to worry about is whether the mics are working, or if the dj has the schedule correct. With Ray, we didn't worry a bit! Thank you Ray! Ray went above and beyond what we expected for our wedding reception. He stuck to our list of preferred songs while allowing our guests to make requests on the spot. He was so easy to work with, worked seamlessly with our other vendors, and allowed our reception to run smoothly. Our guests had a blast, and we couldn't have asked for a better experience! So professional and easy to be around. He understands what music to play to get the party starting! Dj Ray was great! Very easy to work with. We requested a few songs to be played during the reception and asked DJ Ray to build a playlist around those songs and he did just that. Everyone stayed and danced all night till it was time to leave. Thanks DJ Ray! From start to finish Ray was incredibly helpful and responsive. We felt very comfortable coming to him for recommendations and input during the planning process. It was a great feeling knowing we could trust his expertise. I can honestly say we didn't have to worry a bit and the day-of went off flawlessly. We definitely recommend Ray to anyone looking for DJ services! Ray is one of the most responsive persons I've ever dealt with. He responds in the matter of hours, not days. Moreover, he's incredibly professional. If you want a DJ that will meet with you ahead of your event (he met with us twice), discuss your questions and options, and follow through on every detail you discussed Ray is your guy. Ray is very thorough and digitally organized. He has a website that allows you to plan all aspects of your ceremony and reception including listing out musical choices for each item (wedding processional, recessional, grand entrance, etc.) It also allows you to specify you will be in each role (parents names, those in the grand entrance, persons giving toasts, etc.) 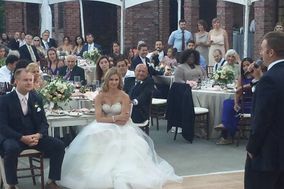 so Ray can follow along during your wedding and cue people or music at the exact right time. Finally, Ray is a professional DJ who is inconspicuous. Despite running everything to plan and getting the dance floor happening and keeping it going he never made himself the center of attention. In fact, you barely knew he was there. That, to us, was the hallmark of a great wedding DJ. Photos to come shortly. Just got married 6/23/2018. We selected Ray based off of multiple personal reviews from friends who used his services for their weddings, very happy we did! Things are busy and chaotic and I wasn't the best or most clear with communicating, but Ray was amazing and well seasoned and pulled off an amazingly well timed set of songs. He's very professional and polite, I'm so thankful for how he added to the wedding being a success! I would definitely recommend RJ services to anyone! I'm sure I didn't make it easy for him being a distracted bride but he had it all on lockdown! The music, the sound, the lights, all of it perfect! You rock! Totally appreciate everything! Ray was a terrific DJ! We decided to have our ceremony in a different location than our reception and Ray was able to accommodate both locations (even accommodating an outdoor ceremony in Deception Pass!) Ray picked wonderful music that fit with our vision and mood for the day and supported us in moving along during the reception. He was very professional, kind, and wonderful to work with! The music was a highlight of our day and we are very grateful for all of his help! My wife and I were married on 3/10/2018. We selected DJ Ray based on the numerous positive reviews we saw as well as the reasonableness of his quote compared to other options. Upon reaching out to him, he was nothing but pleasant and responsive to work with. His website was easy to use and was super helpful with any questions we had along the way. For the wedding itself, minus a few selected songs we wanted him to play for the ceremony and first dance, we didn’t have a real image of what we wanted for music. We had a very mixed bag for our guests. He did an amazing job of playing a variety of music that seem to suit everyone’s desires. I would highly recommend DJ Ray for your DJ needs. He did an amazing job at our New Years Eve wedding!! I wiuld highly recommended his services!! I married my high school sweetie of 13 years on new years eve. After many years and 2 kids this was a dream night for me. I really wanted the playlist of my dreams to match he delivered that and made my night complete. He was dressed nicely, on time, great setup, and flexible when things were off on timing! Responsive and friendly. You will not be disappointed!!! Had Ray DJ for our wedding reception. Ray was very quick to respond via email or phone with any questions I had before the wedding. During the reception everything went well, he was attentive all evening to make sure the music was appropriate for our timeline and easily adjusted to any changes I made throughout the evening. Ray is a very easy going guy, does what you ask him too, easy to contact and very quick to respond, flexible for meetings, always kept in touch with my other vendors during the wedding to keep things running smoothly. Great song choices too! Thank you Ray! Ray was very professional from beginning to end. He arrived extra early to make sure everything was setup. He has been very responsive to emails and requests. Great DJ for your event and very nice guy overall. We are very happy that we went with DJ Ray for our wedding. All other DJ's that we looked at in the greater Seattle Area were at least twice as expensive. Ray is very well organized and his communication is fast, like within an hour or two of emailing him. Our wedding reception was indoors at the Tacoma Museum of Glass and he provided music for the dinner and reception along with dance lighting to make for a great ambiance. DJ Ray will ask you what songs you would like to hear and when. For instance, we provided him a list of songs that we wanted to hear at dinner and during the reception. We didn't have enough songs to fill the entire evening, so he filled in the gaps with plenty of songs that fit the genre and mood. He even was able to obtain our first dance song, which wasn't originally available on his list on his website. He is very good at reading the vibe in the room transitioning from one song to the next. He provided wireless mics for toasts and some MC services as we transitioned between dinner, speeches, and dancing. If you are looking for a DJ that can play the songs you want to hear, fill in the gaps with music that is appropriate for your evening, then I highly recommend DJ Ray. He was extremely easy to work with and very helpful in providing some tips for our wedding day. Very simple and straight forward. I will definitely keep DJ Ray in mind should I need DJ services again in the future. Ray was awesome. He was responsive and flexible. He checked in with us throughout the night if there were going to be any adjustments made to the original plan. He rolled with changes without pause. He managed our drunk guests making endless requests with grace and professionalism. He was one of the vendors that made everything easier that day. Lots of guests complimented the music. Not one person complained about it being too loud or any other typical music complaints. He kept people moving not the dance floor all night! Couldn't recommend him enough! Thank you for making our day special Ray! Full disclosure: Ray is my cousin. I was actually a bit apprehensive about hiring family to DJ my wedding (sorry Ray! ), so I did a lot of online scouting to make sure he had good reviews (glowing! ), a solid, informative website (check! ), and overall seemed legit. As it turns out, my cousin Ray is an awesome wedding DJ and I'm so glad we hired him. Throughout the planning process he was helpful, with easy to use online tools to help us map out our ceremony and reception music and meeting with me to scope out our non-traditional venue for equipment placement. During the wedding reception he was very professional and helpful in making announcements when needed and kept the dance floor bumping with people of all ages! He even DJ'd karaoke hour for us, keeping everything moving and ending the night on a high note!